We’re finally getting there. 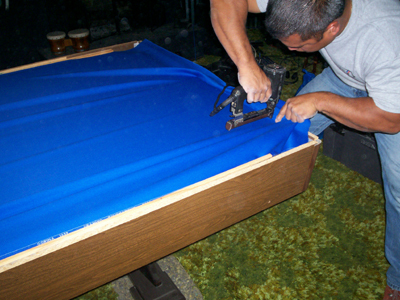 This is where we really get started with the pool table felt. 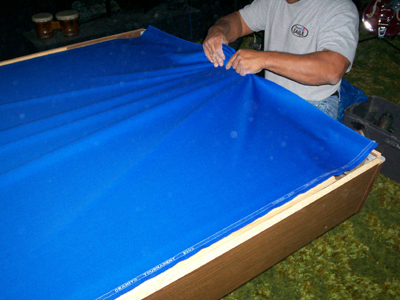 With all of the pocket prep done, its time to start placing it. 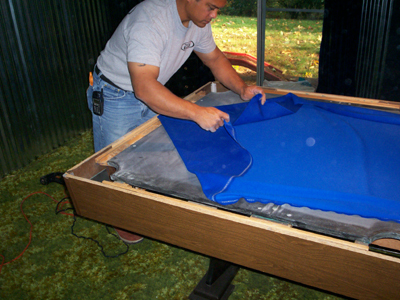 As Allen unfolds the felt, he is very careful about not letting the it fall into the pockets where the fresh cement is. 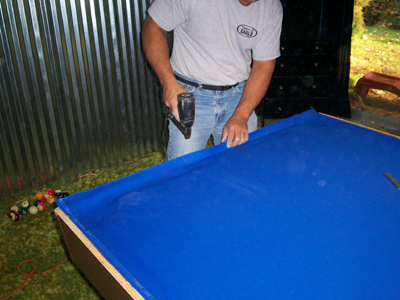 This step makes you really feel that you’re accomplishing a terrific DIY project. Never mind that you are saving hundreds of dollars! The huge feeling of accomplishment and pride you will be getting out of this is just around the corner! 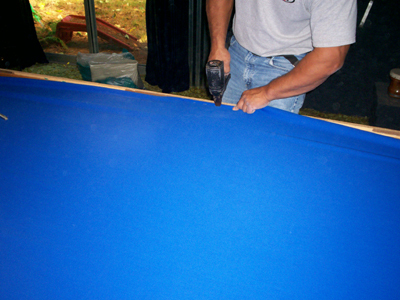 Imagine, you are just about to play your first game on this perfect new felt and smooth slate that lays beneath it. Get ready! 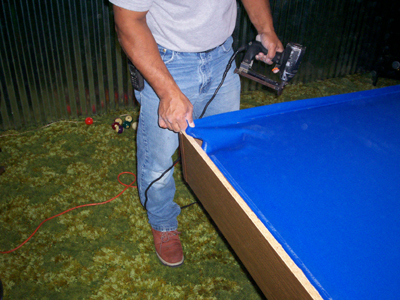 We’re more than half way there at this point and you’ll soon be the hero of your recreation room — even if you have ugly carpet in it like we do. Haha. 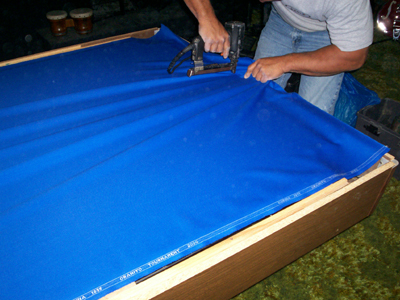 La out the felt over the slate. 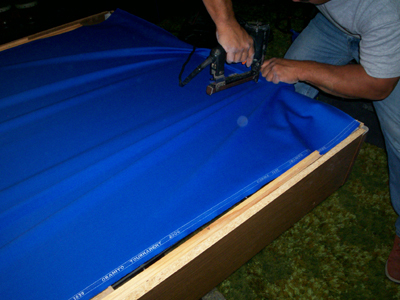 Starting at one end, and making sure the felt is nice and square with the table, start stapling in the center, and work your way to the sides. 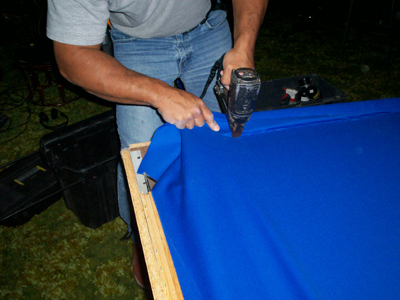 Manipulate the felt as necessary to keep it straight as you continue stapling. Start at the center, and work your way to either side. With one end totally secured, go to the other end, and pull it TIGHT. You can see that Allen is pulling pretty hard as he works his way to the end. 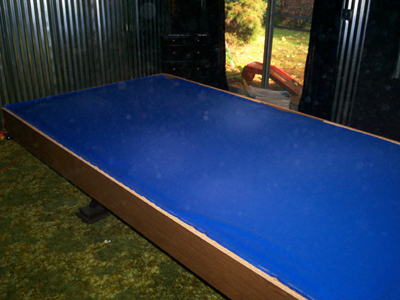 Now to the sides….once again, start at the center of the pool table, and work your way to either side. The first side that you do, doesn’t need to be pulled very tight. Just enough to keep it straight as you staple.